This is a delicious grain-free dinner option. Not only are you omitting grains, but you are adding vegetables, and getting your protein from cheese. Is it possible the kids will still enjoy it? There is only one way to find out. This recipe proves a new way to make a pizza without the doughy crust. Let’s see if it is just as good. Wrap bulb garlic in tin foil and roast in a 350° oven for about 20 minutes. Remove and let cool. Turn oven up to 450° and let preheat. While oven is preheating, saute cauliflower in butter until soft. Salt and pepper and allow to cool. Melt a teaspoon of butter in pot and add spinach. Allow to wilt, about 2 minutes. Drain excess water and roughly chop. When cauliflower is cooled, process with 1 cup shredded mozzarella cheese, 2 tablespoons Parmesan, and 1 egg. Press mixture onto bottom of a greased round 10-12″ cast iron pan (depending on how thin you want the crust) and bake at 450° for 10 minutes or until crust is browned. Mash roasted garlic in bowl with oregano and drizzled olive oil to form a paste. Spread onto the pre-baked crust. 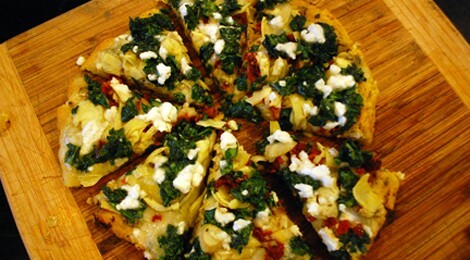 Top with mozzarella, sun dried tomatoes, spinach, artichoke, and crumbled feta. Bake at 400 ° for about 10 minutes or until cheese is melted.